Another weekly digest of the pictures I’m putting up every day on my Hull Photos web site where you can see a new picture every day. I also post them on my Facebook page, along with the short texts shown here, which are not yet included on the web site. Comments and corrections are welcome either here or on Facebook, and will help me to get the finished texts which will eventually go on Hull Photos. Hull photos is divided into a number of sections, and the picture captions end with the name of the section that image has been placed in. Clicking any of the images will take you to it in that section of the site where you may find related images. 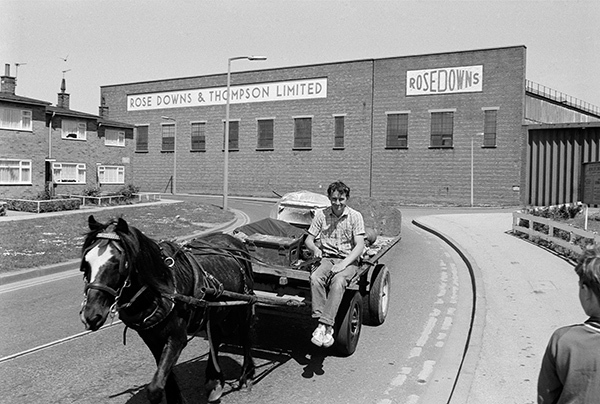 A young man smiles as I take a picture of him sitting on his horse-drawn cart on Bridlington Avenue in front of the works of Rose Downs and Thompson Ltd.
I’ve written earlier about Rose Downs and Thompson Ltd, iron-founders and manufacturers of oil mill and hydraulic machinery, and their pioneering work in the UK building their listed 1900 factory extension (not in this picture) and the bridge on Cleveland St using the Hennebique ‘ferro-concrete’ system. 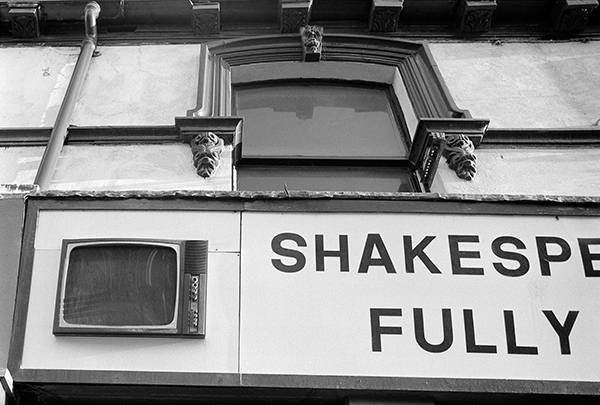 Shakespeare TV and Electronics was the place to go to buy a reconditioned TV, or for repairs, and they advertised their shop at 177 Springbank with the front of a TV on the fascia board. This and the adjoining shop had some fancy decoration around their first floor windows, though a redundant strip of angle iron didn’t add to the effect. The shop is now a multicultral food store. Myrtle Villas, off Springbank roughly opposite Stanley St, was surely one of Hull’s shortest terraces, with only two houses on each side. 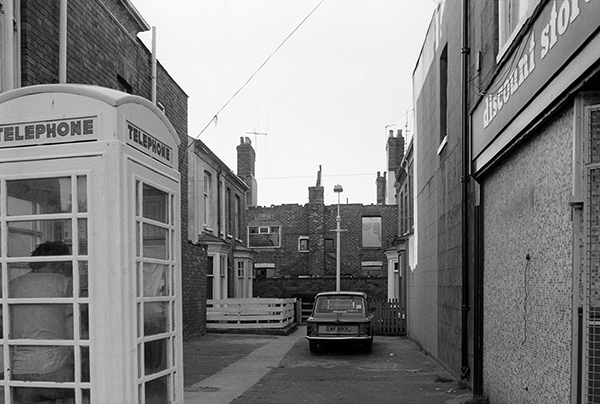 But it did have its own Hull telephone box. The houses across the end were being demolished when I took this picture, and the terrace now looks less enclosed and leads to further properties. The discount store on the right is now ‘Grab A Bargain’ and on the left is ‘Urban Trendz’. There is still a phone box, though I might have to wait a long time to see anyone using it, while back in the 1980s queues were not unusual. Demolition was happening on a large scale in the area between Springbank and Beverley Rd and I took seven pictures. 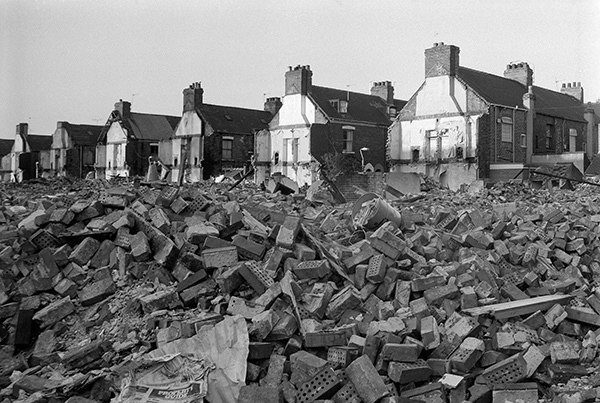 This image is unusual in that the demolition has cut through a long stretch of tightly packed houses and has left what appears to be a massive pile of bricks – and at bottom left a pile of old newspapers with the ‘Property Guide’ at the top. The decoration on the side of a former fire-station in Hall St now has a Hull Heritage Blue plaque stating it to have been the home of the Hull Volunteer Fire Brigade. There two wider doorways, slightly differing in size, one perhaps for the fire engine, and the other for the hroses that would have pulled it. That on the left is decorated with three horses heads and the other with images of three fire captains in their helmets, one at each side of the arch and the third on the keystone. The right hand arch also has a decorative pattern in the brickwork of the arch and small windows across the doors. I made two exposures on this occasion, one showing the whole of the right hand gate and two of the horses heads on the left, and the second moving in closer to show just one of the horses and a man apparently looking up slightly towards it. 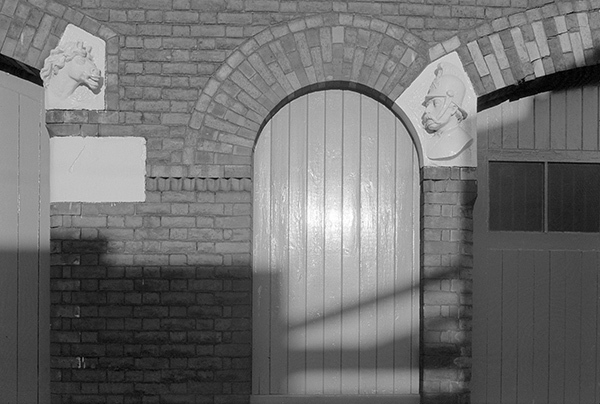 There was no plaque when I took my pictures, but it looked as if the building had been recently painted with the decorative figures picked out in white, slightly carelessly as there is some paint on the brickwork around. It looks as if the paintwork was a pale colour when I took these pictures, perhaps cream; later they were painted maroon and in 2008 repainted a dark blue. 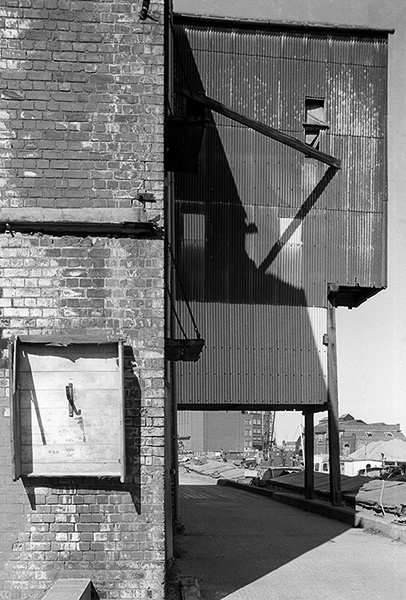 The empty open box on the wall has a hook which probably once held a lifebelt and a cast-iron covered structure projects out over the riverside pathway and overhangs the river above a covered barge. The river seems full of vessels, but the only easily identifiable one is the barge Poem 21. In the background across the river is Clarence Mill and the former Trinity House buoy shed. On the large heaps of sand at the wharf at right is the tiny figure of a man with a shovel, apparently facing an immense task. The picture is taken from the end of Bishop Lane Staith and the Grade II listed building here is Ellerman’s Building, 38b High St, converted into flats in 2000. Out of site on the west side of the building is a stone with ‘G G M 1655’ which was retained from a former building on the site when this warehouse was rebuilt around 1800. 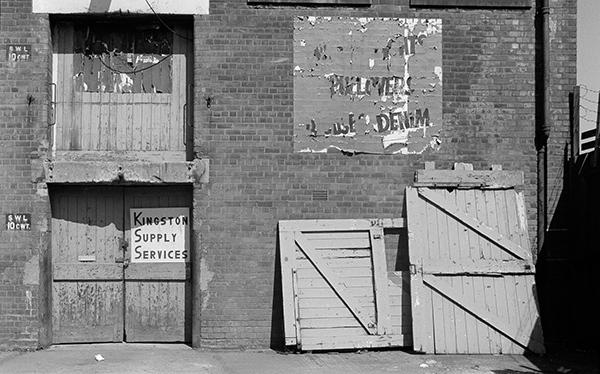 Kingston Supply Services was on Lime St on part of the site which is now a 24 hour car park next to L A Hall Roofing Contractors and Merchants. The building was demolished around 2010. The peeling sign once offered – among other indecipherable things – Pullovers, Blouses and Denim. Some years earlier there had been a board a few yards down the street for Hull Ships Stores and this building may have been a part of this. At left are the buildings of Associated Tyre Specialists, still present with a frontage to Great Union St, now occupied by Adams Fast Food Supplies. Beyond them the buildings of Clarence Mill; those on this side of Drypool Bridge still standing and occupied by Shotwell, with the larger complex behind with ‘Clarence Flour Mills’ on its side sadly (and insanely) destroyed. 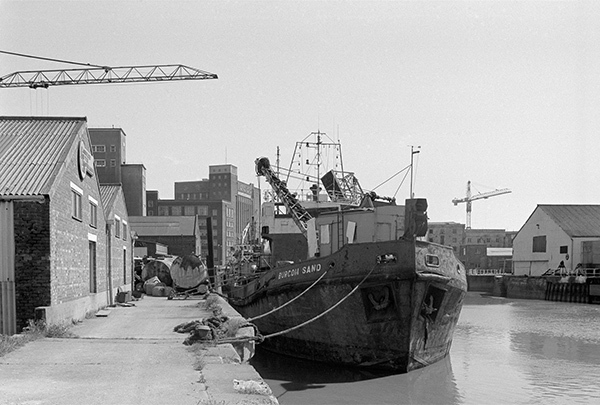 The tanks and other objects blocking the riverside path are in front of the Union Dry Dock and at the right of the picture is the entrance to another dry dock, with a large shed of the Yorkshire Dry Dock Company to its right, between it and the former Queen’s dock entrance. Burcom Sand, named after a sandbank in the Humber estuary between Grimsby and Sunk Island was a grab hopper dredger built in 1954 by Cook, Welton & Gemmell at Beverley which worked extensively for the British Transport Docks Board around the Hull docks in the 1960s and 70s. Later, like the Kenfig I also photographed here, she was owned by Dave Cook of Hull and used for jobs like removing old jetties. She was apparently fixed at the bow to piles at low tide with a wire hawser and pulled them up and out as she rose with the tide. She was broken up across the Humber at New Holland in March 1994. This entry was posted on Friday, November 17th, 2017 at 09:04 am and is filed under Hull Photos, My Own Work. You can follow any responses to this entry through the RSS 2.0 feed. You can leave a response, or trackback from your own site.